A new axis has formed. It is so colossal, the world could almost spin on it. The Trumpet and its predecessor have forecast it for more than five decades, but now the world is catching on to this undeniable trend—and realizing the massive implications. The types of headlines that would have seemed strange 50 or 15 or even five years ago have now become commonplace: “Time to Take the Russia-China Axis Seriously” (Diplomat, Nov. 4, 2014), “Putin Accelerates Turn to China” (Courcy’s Intelligence, Nov. 7, 2014), “Why Chinese-Russian Friendship Is Here to Stay” (Foreign Affairs, Oct. 29, 2014). We’ve been looking for this seismic geopolitical event for half a century. And now, somewhat suddenly, it has arrived. Last May, Russian President Vladimir Putin and Chinese leader Xi Jinping inked a gargantuan gas supply agreement worth $400 billion. Less than six months later, they did it again. On November 9, they signed another tentative agreement worth a sum of similar immensity. It is hard to comprehend the size and significance of these deals. To start with, they are the two largest business transactions in human history. Kang Wu of FG Energy said the China-Russia energy deals “will really cement their relationship in a big way, and the political implications are huge.” One of the most immediate huge implications is that, with this second deal, China will eclipse Europe to become Russia’s largest and most strategic natural gas consumer. Thus, Moscow will be able to punish the European Union by cutting off its gas flows at less cost to the Russian economy. Europe’s already weak economy is certain to see energy costs skyrocket, forcing Europeans to scramble for pricey alternatives in the middle of what forecasters expect to be an unusually cold winter. In addition to those two mega energy deals, Putin and Xi signed 17 other “major bilateral business agreements” at the Asia-Pacific Economic Cooperation summit in Beijing that ended on November 12. This followed 38 other major deals in October worth tens of billions of dollars. These colossal business agreements are only the latest indications of a Russia-China axis that is forging fast. This axis is reorienting 21st century geopolitics—and tilting the advantage away from the West. “The two longtime foes have drawn increasingly close together because of a confluence of geostrategic, political and economic interests—all of which have a common theme of diminishing, subverting or displacing American power,” wrote Douglas E. Schoen and Melik Kaylan in their new book The Russia-China Axis. The Westerners’ concern about this anti-U.S. partnership is not ill founded. And it takes on a bleak, Siberian iciness when you realize one of the main forces welding Russia and China together has been the United States. Rewind to the 1990s. The U.S. helped persuade Ukraine to give up its nuclear weapons—the same weapons that might have made Vladimir Putin think twice before rolling tanks, troops and antiaircraft missiles across the border. But now Ukraine is nuclear weaponless—and Putin is not. For a long time, America has also led nato into unwittingly provoking Russia. Most U.S. leaders viewed attempts to expand nato into Ukraine from a liberal worldview, seeing it as a benign promotion of democracy. But the Russians saw it quite differently. “Russians have continued to view it through the prism of geopolitics where balance-of-power calculations drive threat assessments,” wrote James Kitfield, a senior fellow at the Center for the Study of the Presidency and Congress. And they consider Ukraine to be a driveway straight into the heart of Russia. Putin responded to nato’s encroachment (and what he saw as U.S. meddling to topple Ukraine’s democratically elected leader) by annexing Crimea, destabilizing eastern Ukraine. The U.S. then levied several rounds of economic sanctions on Russia as punishment. Europe followed suit, and the West hoped Putin would feel the squeeze and back down. Instead Russia only intensified pressure on Ukraine. Then looked east, mostly to China, in order to recover its economic losses. Under the current administration, America has also revealed to Putin that its populace is war-weary, its policymakers are disunited, and its leaders are power-thirsty at home but deliberately weak internationally. All of this served as a bright green light for Putin’s expansionism. What about China? How did it become such a cash-rich country that it can partner with its northern neighbor and finance Putin’s aggression? America played a vital role in that too. U.S. tycoons—eager to maximize short-term profits despite long-term costs—have outsourced as much production as possible, largely to Chinese companies. Most Americans prefer to pay as little as possible for electronics, computers, clothes and other goods, even if it means many other Americans lose their jobs. Thus, the trend continues. From 1998 to 2010, U.S. manufacturing, as measured by the number of jobs, plummeted 34 percent. Millions of these went to China. The U.S. also has an alarming trade deficit with China. In 2013 alone, America bought $318.7 billion more from China than China bought from America. Since 2000, the total trade deficit has topped $3.2 trillion. So a fair amount of the hundreds of billions of dollars that China is paying Russia for these two mega gas deals and the other economic agreements originally came from the United States. A look at how Putin’s Russia has behaved in recent months since securing China’s backing gives us a good idea of what this Asian juggernaut might do in the future. 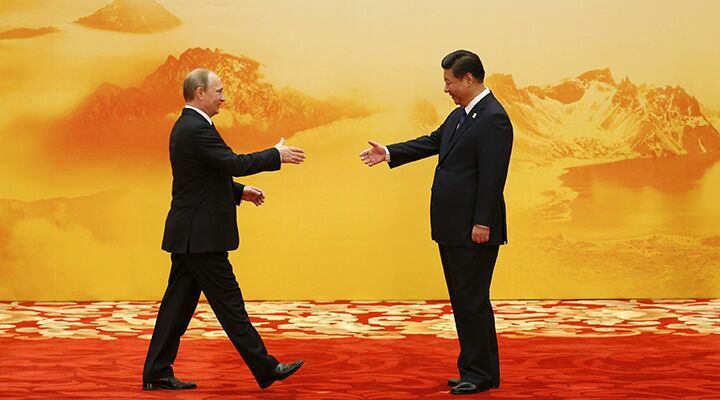 The Russia-China axis is no longer merely a forecast. It is here, and it is changing the world. The world now faces the most serious crisis since World War ii, and it is thanks in part to America’s broken will and mismanaged power. Such a rebirth won’t come about by something as meaningless as “getting the gop back in the White House.” The nation’s illnesses are too numerous and too deep-rooted to be remedied by a topical balm of that kind. But there is a solution for America’s crisis in leadership, and for the increasing power, cooperation and belligerence of the Russia-China axis. To understand it, read Russia and China in Prophecy.